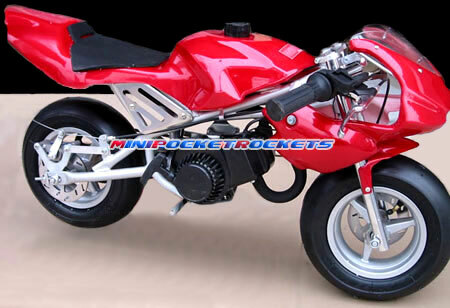 At MiniPocketRockets, we offer a full range of 47cc pocket bikes to fit your everyday needs. Whether you are an inexperienced rider looking to learn or an advanced hobbyist, we've got a 47cc pocket bike for you. Our "no frills" Cagllari Daytona 47cc pocket bikes are the best bang for your buck. For our more advanced racers, The Grand Prix MX3 is another 47cc pocket bike that features a Computer Aided Design (CAD), tubular racing frame, full fairings with available battle stripes, dual fenders, and a redesigned aerodynamic profile. Our Blade 49R 4-Stroke pocket bike is built for racing and riding on tight track conditions. In fact, the Blade 49R pocket bike was designed for fierce handling on any concrete or asphalt surface. If you're looking for a 47cc pocket bike that gives maximum output, than look no further than the Raptor. This 47cc pocket bike has had its torque increased but it hasn't lost any of its actual top speed. While all of our 47cc pocket bikes perform to the highest standards, our GP RS-R is the next evolution in 4-Stroke pocket bikes. While maintaining the size and weight of a standard 47cc pocket bike, the GP RS-R offers a multitude of features found only on larger 4-Stroke pocket bikes. We deliver the same quality and attention to detail to our 47cc pocket bikes as we do with every style of pocket rockets we sell. However, we understand ultimately that for every one of our customers "riding is believing." We are confident the moment your new pocket rocket arrives at your door, you will know that you have ordered a superior product. Our bikes are ready to go, right out of the box. But we highly recommend that you take the time to read all the safety material and wear safety equipment. While racing a 47cc pocket rocket is a thrill, your safety is a top concern to us. 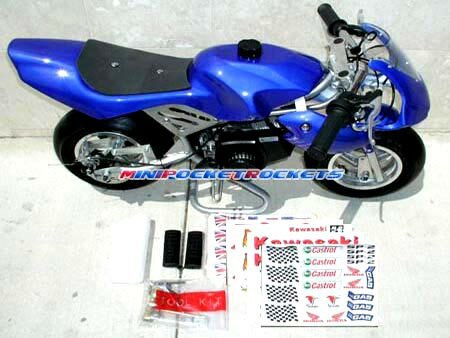 By ordering now, you'll stand the best chance to get the 47cc pocket rocket you want including style and color. Our pocket rockets are always in stock and tend to fly off the shelves. All 47cc pocket rocket orders usually ship within 1 to 2 business days. For just a few bucks more you can add a performance package to enhance your new ride and take your pocket rocket to the next level. All performance and OEM parts include free shipping. All 47cc mini bikes at MiniPocketRockets can reach top speeds of over 35+ MPH, depending on the weight of the rider. If you can picture yourself in one of these sweet rides, we can ship direct to you within 1 to 2 business days. We are committed to helping you enjoy your 47cc pocket bike purchase from us, even well after the sale. And, we will be here for you every step of the way providing you with inexpensive upgrades, highest quality parts and FREE technical support for life! We have sold thousands of 47cc pocket bikes over the past few years and can help you no matter what your question. So, what are you waiting for? Get your 4-Stroke and 47cc pocket bike today! For any questions, please do not hesitate to call us TOLL FREE at 1-877-MPR-BIKES (1-877-677-2453).